This flapjack recipe is adapted from one by Natasha Corrett at Honestly Healthy Food. I cut the amount of syrup by half and added orange zest and spice which I think adds a lovely autumnal flavour. These chewy flapjacks make a great pre or post workout snack to help boost energy levels. The nuts and seeds provide a decent amount of zinc and protein to help with muscle repair. If you have a sporty vegan teen (don’t use honey) these are a great snack to make in bulk and pop in the freezer. They take an hour or so to defrost. Feel free to use any other nuts of seeds that you have in your cupboards. Place the dates and half the water in a pan, bring to the boil, then simmer until the dates are soft. Transfer to a blender. Place the oats, pumpkin seeds and sunflower seeds into a food processor and pulse for about 1 minute, or until roughly chopped. Add these to the mixture in the bowl. Stir in the maple syrup or honey, the mixed spice and orange zest. Mix thoroughly. Transfer the mixture to a 23cm x 15cm baking tray lined with baking parchment and spread out the mixture to a thickness of 2cm. 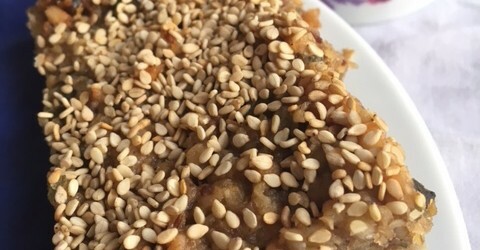 Sprinkle with the sesame seeds and bake for 25-30 minutes until golden. Leave to cool on the baking tray and then cut into slices. Jerusalem artichokes contain more iron, weight for weight, than lean beef.